Members of our community recently joined the Association of Independent Colleges and Universities of Pennsylvania (AICUP) for Student Lobby Day, an annual event held in Harrisburg, Pa., where students, educators, and administrators come together to talk about specific issues in higher education. This year’s topic was the Middle Income Student Debt Reduction Act, Senate Bill 420. The act is aimed to help families with an annual household income of $80,000-$110,000 -- typically defined as middle class -- pay their college tuition bills. Because lower-income students are often the ones who receive federal and state assistance through Pell grants and PHEAA grants, this can leave middle-income students struggling to pay college costs, often out of pocket. This issue is very top of mind for us. With 167 Peirce students who come from middle-income families, it’s important that they have the opportunity to receive aid. However, it’s also important that it doesn’t jeopardize funding for low-income students, who also comprise a large portion of our student body. 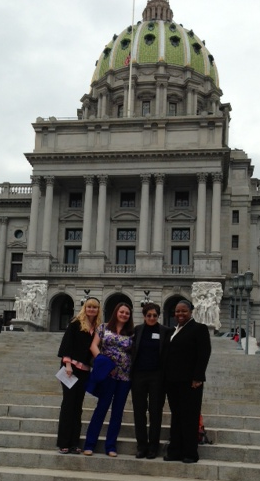 We took four students who are studying in our Paralegal program -- Diana Kirkland, Patricia Evans, Ashley Arntz, and Sohelia (Gigi) Nikpour -- to Harrisburg to discuss this piece of legislation and why it matters to our community. It was the first time any of these students’ were in Harrisburg, and none had ever had the chance to witness lawmakers in action. We asked one of the attendees, Diana Kirkland, to share her thoughts about her experiences from the day. “First off, I was honored to be invited. Secondly, although I’ve been a resident of Pennsylvania for most of my life, I had never actually gotten to visit our State Capitol in Harrisburg. Being inside the Capitol Building was very exciting and meeting the State Representatives was even more exciting. They were very amicable and didn’t mind sitting down with us to discuss the issue at hand, which centered around allowing middle class families who have children in college to receive financial assistance in the form of state funded grants. I believe these students should be entitled to state aid because I've been in situations where because I make just $5 more in income, I was ineligible for some types of assistance that I really needed at the time. I believe that middle-class families struggle just as much as low-income families in certain aspects, one being education. This relates to me personally because I also have a daughter in college and it's very expensive, but nothing in life worth having comes cheaply. Peirce College has enabled me to be a part of so many things I wouldn’t have had the opportunity to participate in if I were not a student here. I love my school and praise Peirce for taking students under their wing and providing us with opportunities that make us well-rounded individuals. I believe this experience will enhance my professional abilities in being a Paralegal. I’m learning so much about how our legislature works; I know that the legislature is responsible for deciding upon and passing the laws that we as Pennsylvanians’ must adhere to. But, at the end of the day, it is up to the people to vote legislators into office who are going to do what’s best for society at large. We, as people, have a voice. If enough people decide that a particular legislation is unjust, then we have the right to go to Harrisburg and lobby against it to get the legislation changed, amended, or just done away with. This was my first experience with doing just that. I believe Senate Bill-420 should be passed to make it easier for middle class families as far as student loan debt is concerned. I have plans to enter law school upon completion of Peirce College and to eventually become a Municipal Court Judge, so being able to participate in this event showed me some of the things I have to stay knowledgeable about in order to achieve my goals. The law is exciting and I want to know all that I can to be the best professional I can be. It was wonderful to see these students witness law-making first-hand. We think it’s very important that our students obtain real-world experiences as part of their college education to give them the insights and tools they need to succeed after graduation. If you’d like to support passing this act, visit its website to see how you can get involved.